APPLETON, Wis. — Friday night, students at Appleton North High School presented "Homelessness, not Hopelessness." Students were acting as if they were homeless before the performance. Then, theater members read first hand stories of homeless people. "Just to continue raising awareness for homelessness in our area and to continue that discussion among people of all ages," said Claire Rettler, a student a Appleton North High who helped come up with the Rethink Homelessness Awareness Campaign. The program began with a soup and bread dinner with a suggested $15 donation. All proceeds go to Pillars, a homeless outreach program in the Fox Cities. 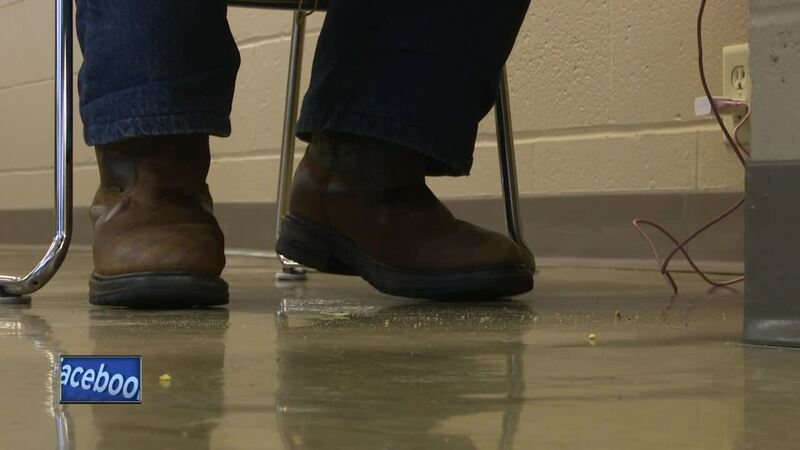 Scott Peeples, the director of community engagement for Pillars told NBC26 that the homelessness in the Fox Cities is as dire as it's ever been with record numbers in their shelters. He said just because we don't often see panhandlers or people sleeping on the streets does not mean homelessness isn't happen in our area. "If you would've told me 5 years ago that I would be homeless, I would've told you no way, but it happened," said Herman John who has been coming to the Pillars Resource Center and sleeping at their adult shelter since September. He said his homelessness has lasted more than those seven months, though. "I remember the first night that I was homeless. Oh it was cold. Oh was it cold," added Herman. He told us he's been homeless for nearly three years. He lived on the streets for the first year in Green Bay and Appleton. For Herman, alcohol addiction is one of the reasons he ended up on the streets. "mental illness, drug addiction, job loss, previous incarceration, all those reasons why people become homeless are all coming a head more than ever," said Peeples. People like Herman can find a positive environment and place to stay with Pillars. "We're providing basic needs, and we're doing whatever we can to get people into a better situation," said Peeples. "I feel good about myself. They make you feel that way, and they make you want to do good for yourself," said Herman. Herman hopes that when he leaves the shelter, he won't fall into this situation again. "If things work out, I want to help people like me. I don't know how I would do that, but I want to show them the way out," said Herman. He hopes others can do the same. "A homeless person is somebody who has all but given up on life. Don't give up on them," added Herman. Herman told us just saying hi and asking how a homeless person's day is going can show people do notice them and support them. If you are interested in getting involved, you can volunteer at one of Pillars' shelter programs, housing programs, and other possibilities. For more information on getting involved, click here .